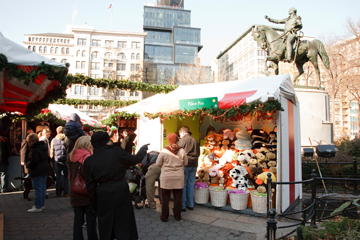 Find the perfect gift at the Union Square Holiday Market. A New York tradition that draws more than a million visitors each year, the outdoor market is the perfect place to gather with friends and family for some holiday shopping and to taste festive foods and drinks. Some of the items that will be offered include gorgeous jewelry from up-and-coming designers, homeware from local artisans, and stylish accessories for pets. Convenient discount parking is available near the Union Square Holiday Market. Click on a location listed in the map for more information on parking or to reserve a guaranteed space.